All of these categories are great measures of success. There are many intangible ways that success can be achieved, but these areas have publicly available numbers that can be gathered and analysed. The rapper who wins the most categories at the end of the article gets crowned the most successful female rapper of all time. The analysis concerns rappers' solo careers (or, in the case of Salt-n-Pepa, their work within the group), and singles released in which they are the lead or main artist. Lauryn Hill's work with The Fugees isn't included, nor is Foxy Brown's work with The Firm, or Nicki's with Young Money. It's also limited to the United States. The dataset included 75 female rappers or female rap groups. If you'd like access to the dataset, or need more clarification or information, please message me, I am all too happy to accomodate. Lauryn Hill dominates this section. The bulk of her sales came from her classic debut album The Miseducation of Lauryn Hill. It has sold an incredible 8 million copies in the US alone. Her live album MTV Unplugged 2.0 contributes another million. Nicki slips to fourth, outsold by Salt-n-Pepa and Missy Elliott. This category goes to Lauryn. Removing the element of "more albums, more sales", this graph listing sales per-album gives a more accurate snapshot of success. Once again, Lauryn wins dramatically. Nicki is well ahead of Iggy. At 31 million single sales, she's more than double her nearest competitor. Lauryn Hill, who won the total album sales, has only moved 1.5 million singles, although it must be remembered she flourished well before the era of streaming. In the late 90s you had to drive to the store and buy a physical copy. Total sales divided by number of singles released, to control for artists who get a lot of sales by releasing a lot of music. While on average Iggy's singles are more commercially successful, Nicki's longevity must be taken into account. Nicki has released 29 singles, while Iggy has only released 11. Nicki's first 11 singles sold, on average, 1.6 million each, about 400,000 more than Iggy. This is the average chart position per-album for an artist's entire career. 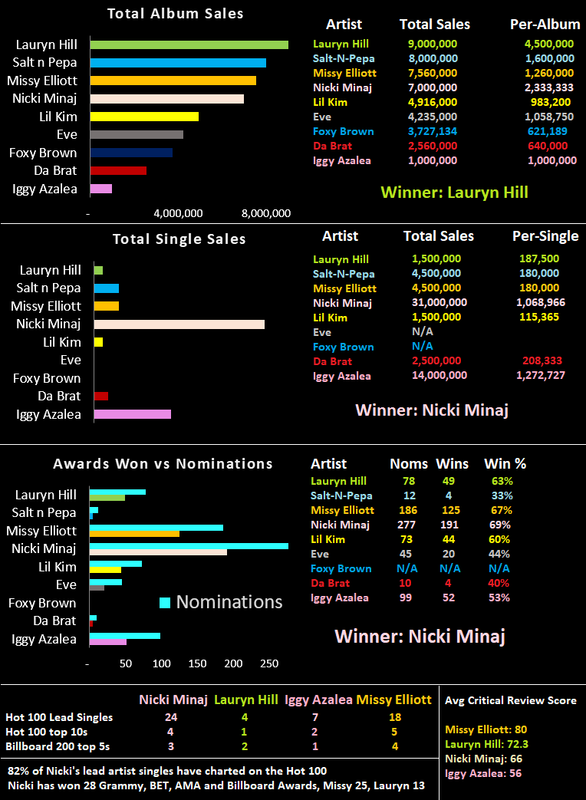 Nicki has a slightly better track record than Lauryn Hill, even though she's released 1 album more. These stats show that every time Nicki Minaj releases an album it charts at 1.3 on the Billboard 200, a stellar record. Nicki's average chart position on the Billboard Hot 100 is a staggering 42, 10 places above her nearest rivals Da Brat, Eve, and Lil' Kim. This means that over her career she almost always charts in the top 40. Her closest competitor is actually Missy Elliott. Missy has the most Hot 100 top 10s with 5. Nicki has 4. Nicki has the most total Hot 100 charting solo songs with 24, while Missy has 18. 82.8% of all singles Nicki has released where she is the lead artist have charted in the Hot 100. Missy is at 72%, Eve at 69.2%, and Lauryn Hill comes 7th with 50%. Nicki is the most awarded solo female rapper in the history of the genre. From 277 total nominations, she has picked up 191 wins. Second is Missy with 186 nominations and 125 wins, then it slips all the way back to Iggy in third with 99 nominations and just 52 wins (although she only has one album in her discography). Amazingly, Salt-n-Pepa won just 4 awards from 12 nominations. Nicki has still won the most awards per album and per single, although Iggy is a relatively close second. It must be remembered that a lot of awards and categories weren't around during the 80s and 90s. The BET awards weren't established until 2001, which is after Lauryn Hill, Eve, Da Brat and Salt-n-Pepa were in their prime. Nicki has also won a lot of weird, miscellaneous awards. "Best Celebrity Fragrance", an MP3 Music Award, "Favorite Animated GIF" at the MTV O Music Awards, and a Nickelodeon Kids' Choice award. The big 4 in hip-hop are the Grammys, BET, American Music Awards, and Billboard Music Awards. Here is how they stack up when only analysing these four categories. And remember, BET only began handing out awards in 2001, so Lauryn Hill, Eve and Salt-n-Pepa missed out on these. Nicki wins again with 28, but she hasn't won a Grammy. Missy comes second with 25, but she's only been nominated 62 times, compared to Nicki's 105. Lauryn Hill comes third with 13 wins from just two albums, and her nomination-win ratio is significantly better than Nicki's. Nicki, the overall winner, falls to 7th in this comparison. On average, her albums have recieved a 6.6/10 from critics, whereas Missy's, over the course of her six albums, average a muscular 8/10. Lauryn Hill's classic debut album holds an 8.7/10 average, but her MTV Unplugged 2.0 release, which is counted in every other chart in this article, has an average score of 5.7/10. Nicki's claims to be the most awarded female emcee of all time are entirely correct. She has also sold the most singles, and has the best average chart position for both albums and singles. A staggering 82% of all singles Nicki has released have made it onto the Billboard Hot 100. Missy is the quiet achiever of the analysis. She's had more top 10 hits than Nicki, has a better nomination-to-win ratio for major awards (40% vs 26%), she blitzed the critical analysis section, she has the second most total awards, and came third in total albums sold. She doesn't get the credit she deserves for an illustrious and trailblazing career. Few will argue that Lauryn Hill is the most complete emcee on this list. Her work with The Fugees will go down in history as some of the most adept lyrical and technical work, regardless of gender. Her first album, The Miseducation of Lauryn Hill, is considered a classic record, and arguably she has the only classic album in this analysis, although in time Missy might have one or two on the same level. Her nomination-to-win ratio in awards was 44%, and she has an incredible 8 Grammy's from just two records, doubling Missy's haul. Not only do the numbers give cred to her standing in the game, she is regularly spoken of in the "Top 5" and "Top 10" conversations, one of the only female rappers who can boast this reputation.